Grab your knife and fork get ready to dig in to human history through the lens of food and the struggle to acquire it with award-winning celebrity food editor and author Tanya Steel and her husband, historian Robert Steel. Plus 30 kid-tested and approved recipes inside! Did you know that Christopher Columbus set out on his most famous voyage not in search of the new world, but looking for cinnamon? Or that rich people in the Middle Ages served flaming peacocks and spun sugar castles to their lucky dinner party guests? Did you ever wonder why M&Ms were invented? (Hint: That candy coating isn't just for decoration!) The quest for food has inspired all kinds of adventures and misadventures around the world and this book explores the wildest and wackiest of them, from prehistoric times through modern day. 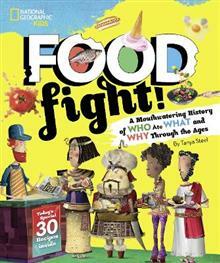 Hungry readers can go on a finger-licking romp through the ages to discover the origins of today's common foods, yucky habits of yore, marvelous inventions that changed the way we ate and cooked, the weirdest menus on record, plus amazing stats, fast food facts, and more. It comes with 30 original recipes, each specific to a particular time and place. So, if you are curious about how food shaped global history and culture, put this book on the menu.